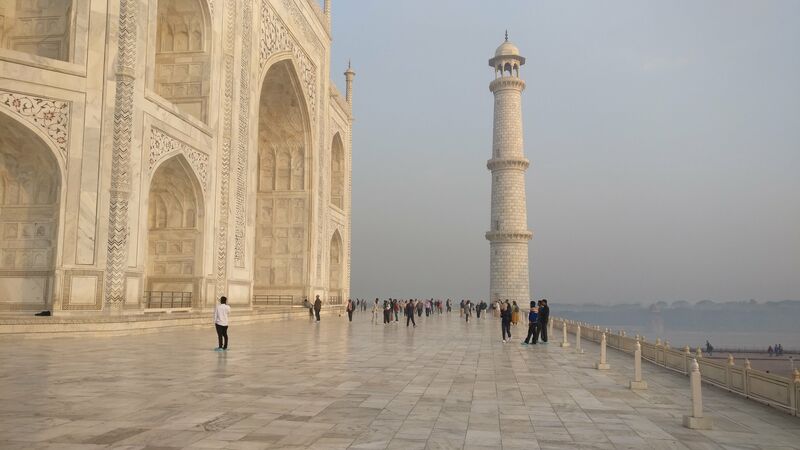 When people visit Agra - the second stop on India’s Golden Triangle - they are not coming to see the city that 1.6 million people call home. Every year up to eight million people travel from all over the world to see it. A UNESCO World Heritage Site and one of the New7Wonders of the World, your goldfish has probably heard of the Taj Mahal. It is the most amazing place I have been to in my entire life. From Delhi, Agra takes just over three hours by train, covering some 206 kilometres. 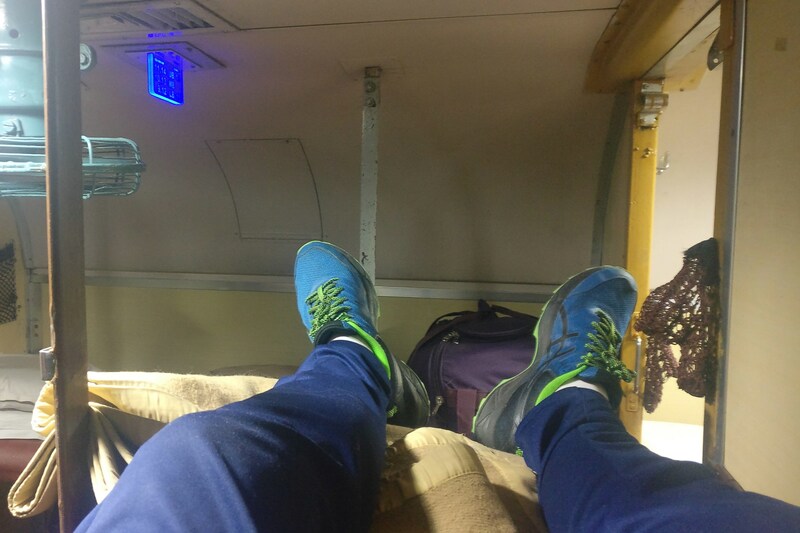 This was to be our first of several train rides in India, and it was something we were both nervous and excited for. We found it really difficult to even reach a stage where we could purchase our tickets online, and were about to look into alternative modes of transport when we finally came up with a solution. Seriously…it took over a month to register on the official train reservation website. I even went to the length of contacting the Minister of Railways, which lead nowhere. I will explain what we did to resolve the issue in depth another time, but if you need help more urgently contact me and I’ll try to help you out. The trains in India do not have any digital display or voice-over telling you when to get off and you can’t rely on the schedule as the train will be running late more often than not. Use an app or website like RailYatri which will show you the live running status of your train. You will be completely lost without it. We pulled in to Agra Cantt railway station about an hour late. As we step off the train onto the platform we hear cries of “taxi! taxi!” directed at us. We learned that in order to get the best deal, you should avoid people like this and instead go out of the station and look for a taxi or tuk tuk by yourself. It turns out that this station only has one prepaid taxi booth with fixed prices, so it’s the same price regardless of who you go with. It was expensive, so if you have internet you should use Ola for a better deal. The only places in Agra you will probably visit are the Taj Mahal and Agra Fort (another UNESCO World Heritage Site). For this the best way to get around is by tuk tuk. You can find them on every corner, now it’s up to you to negotiate a good deal. 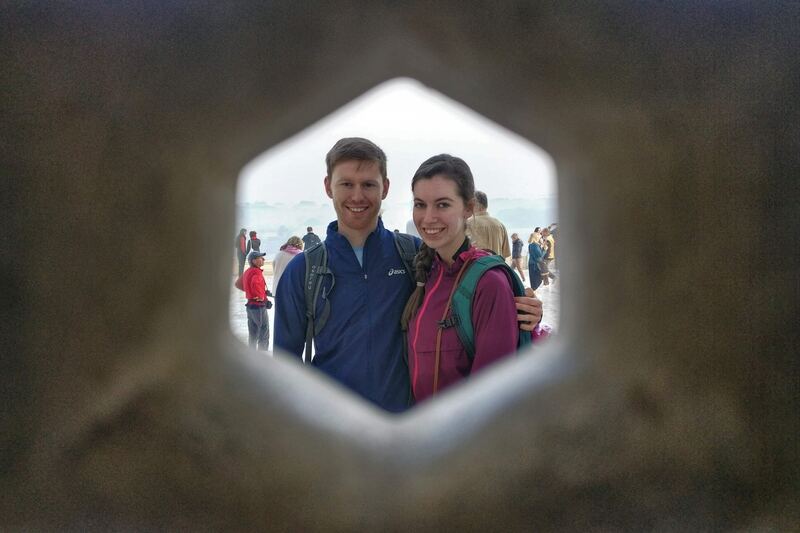 There are three UNESCO World Heritage Sites in Agra, I’ve mentioned two. The third, Fatehpur Sikri, is located 40 kilometres outside of the city, so we didn’t make it there. Entry: Rs 1000. We decided to pry ourselves prematurely from the comfort of our bed at 04:00 to be here for sunrise. We found a tuk tuk pretty easily and arrived at the Taj Mahal entrance at about 05:00 to find a long queue ahead of us. Nooo! We thought we were going to miss sunrise. A tour guide hovering near the queue told us that we can skip it if we get a guide. Not wanting to miss what we had gotten up so early for, we didn’t hesitate in saying yes. We hopped the barrier right in front of the queue as they all watched us, probably thinking cunts. Next obstacle: baggage checks. We weren’t aware of the many Dos and Donts for coming here, other than the strict dress code. We each had a book and I had a GoPro selfie stick which security were convinced was a tripod - two forbidden items. Luckily our guide worked his charm on the guards and we were allowed to bring them in on condition that they stayed in our bags. So yeah, read the official list of do’s and dont’s provided by the Department of Tourism. We probably would have made it into the palace grounds in time for sunrise, but having a guide was useful because he brought us to the best place to watch the sun rising over the palace. If you want to see it, head towards the mosque situated to the left of the Taj Mahal. As you can probably see from the picture above there is another benefit of coming this early…very few people around! Come at noon and the paths either side of the water will be crowded with tourists, ruining that perfect shot. We parted ways with our guide after about two hours. If you have the money, hiring a guide is a good idea as you will learn some things you may not have known about this iconic place without some research. Be sure to only hire an approved guide who show their official identity cards. We found a seat, sat and just watched for a little while. 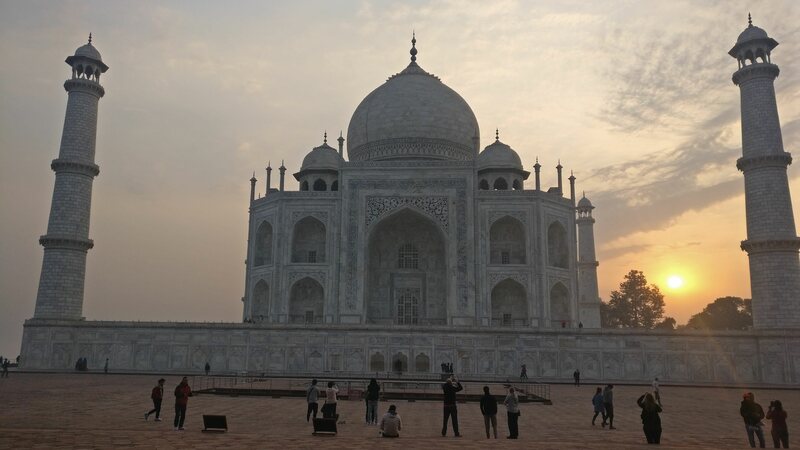 Watched the crowds slowly thicken and the noise level increase, the sun continue to rise high into the sky, and the shifting colours of the Taj Mahal’s marble surface, influenced by the changing colour of the sun. Once outside the palace grounds you will notice something unusual for India (or most places for that matter). It’s quiet. Polluting vehicles are not allowed within 500 metres of the Taj Mahal, all you will see here are bicycles and electric vehicles. This is a great idea as you really notice the serenity from within the palace grounds. The area outside the palace walls is lined with restaurants and gifts shops, ready to serve the happy tourists enlightened by their visit to the Taj Mahal. Our guide highly recommended a restaurant called Joney’s place. We walked around but couldn’t find it (and didn’t have a working SIM card to use Google Maps) so I can’t attest to it’s deliciousness, but we did meet someone later in our trip who said he came here twice in the same day it was so good. Entry: Rs 550. 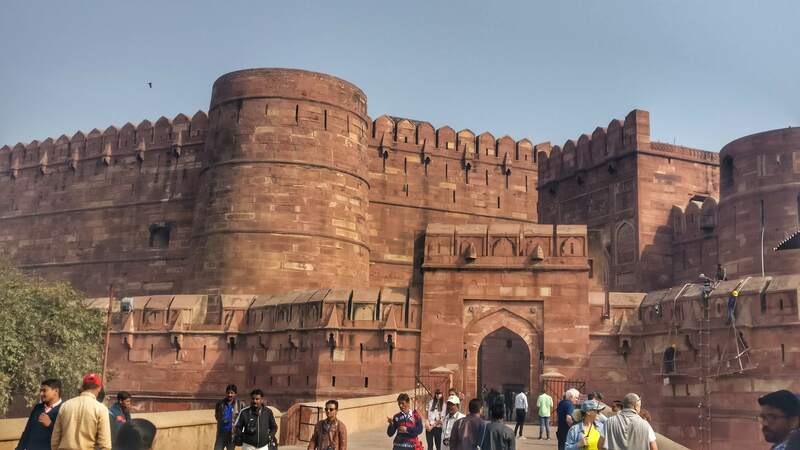 Just 2.5 kilometres away, Agra Fort is worth the short journey by tuk tuk. It was the residence of the Mughal Dynasty until 1638, before they moved to Delhi because of soaring rent prices and expensive child care. Inside the grounds you will find more impressive architecture and well maintained gardens. 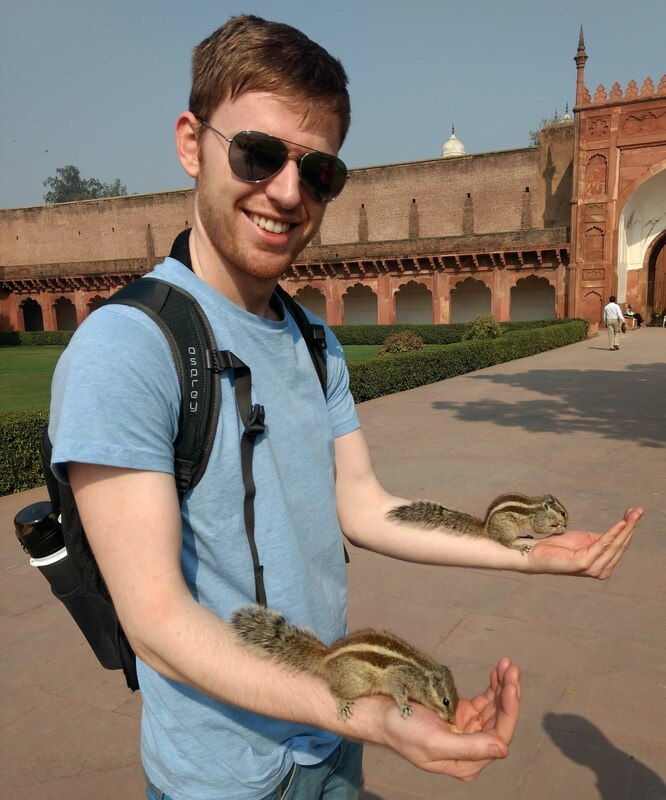 You might come across two maintenance workers offering you the chance to hold and feed some squirrels. Be aware that they will demand money, but only after you have fed and held them. I’m hesitant to call it a scam because most people will cop this before accepting the offer. I am not most people. So that’s Agra done. Next week I’ll tell you about Udaipur (known as the “White City”) in the state of Rajasthan. 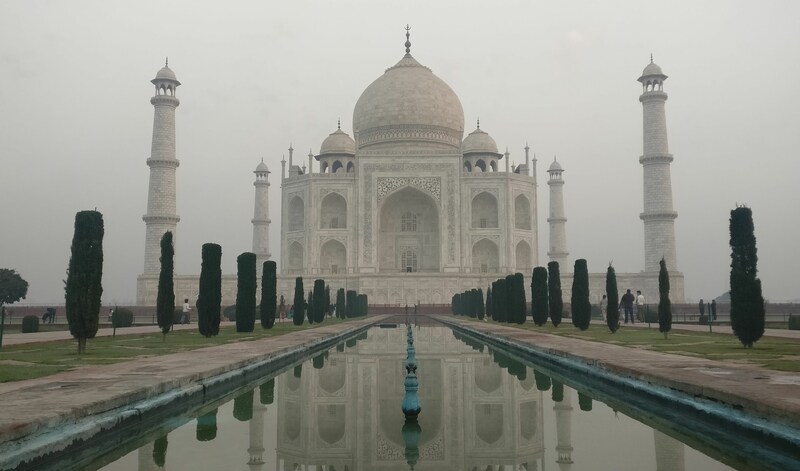 This place is really special and so relaxed compared to Delhi and Agra, and was one of our favourite places in all of India.